In order to become a perfect Network Engineer it is very important to understand the OSI reference model and it's seven layers. Some of us gets board even by hearing the name of OSI because it is theory not a practical configuration, but i bet that after completely understanding the OSI Model the networking will become more interesting to you. The Standards Organization (ISO) developed a theoretical model of how networks should behave and how they are put together. This model was called Open Standards Interconnect (OSI) model. This Model is always in the middle of any discussion of networking and network, and sometimes in computer troubleshooting as well. The "ISO OSI Model" was developed because it appeared that IBM was going to patent the design of their SNA networks so that no one else could use IBM's design model for networking. Today this model is being used throughout the network, internet and telecom industries to describe various networking issues. The OSI model is not a Program, Technology, Protocol, Hardware or Software, it is a theoretical model which provides a way of thinking about how networks 'work'. The OSI model is used so commonly as a point of reference that you really should learn the OSI Model's seven layers and learn how the OSI Model explains this layered approach to networking. Engineers working on a network problem will frequently say "Well, it's a data link layer problem", clearly referring to the data link layer of the OSI Model and more specifically, the physical network connection, not the networking software or the applications. 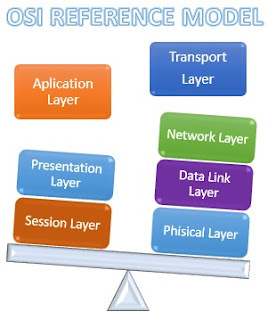 The OSI Model's layers are so well known that they are referred to by number: "Well, looks like we have a layer 2 problem here". If you don't know the OSI Model, you will have a great difficulties as a network engineer, or even talking to one. Each and every layer has a very long explanation and i am afraid that i won't be able to do this in one post but i promise to explain each and every layer individually and more deeply in my upcoming posts, to get informed please subscribe to our RSS feed by submitting your email ids. Till then have a nice time.